Cane syrup is made by simmering sugar cane juice in open kettles until it forms a thick, dark syrup that resembles molasses. Popular in the south, where it is used as a table condiment and in recipes, cane syrup tastes similar to molasses, but does not contain the sulfur found in molasses. Like sugar, cane syrup makes foods taste sweeter. White table sugar may be made from sugar cane or sugar beets. The sugar cane grown for table sugar is also the source of cane syrup. Both are made up of the simple sugar sucrose. Nutritionally, there is little difference. A tablespoon of cane syrup contains 60 calories. A tablespoon of sugar contains 48 calories. Neither table sugar nor cane syrup contain any vitamins or minerals. Sugars are simple carbohydrates, which your body converts to energy. Your body responds to all sugars the same, whether in the form of honey, table sugar or cane syrup. Consuming these items leads to a rapid spike in blood sugar and a burst of energy. The body uses the energy it needs right away and stores the rest in the form of fat. So eating too much sugar in any form can lead to being overweight. Eating sugar does not cause diabetes, but if you have diabetes, your body cannot process carbohydrates well and eating sugar could result in elevated blood sugar levels. Sugar can lead to tooth decay, too. It takes a lot of processing to extract juice from sugar cane and refine it into granulated sugar. Cane syrup goes through less processing, consuming less energy to make, which may be beneficial to the environment. Cane syrup contains no additives or preservatives. Some cane syrups are made from organically grown sugar cane, which hasn't been treated with pesticides or chemical fertilizers. Because the body processes all sugars in the same way, the type of sweetener you decide to use depends on personal preference. Cane syrup is of no more benefit to your health than table sugar. Although sugar makes food taste better and does no harm in moderation, the American Dietetic Association recommends that you monitor your sugar intake and consume less when possible. Go Ask Alice: Honey vs. Sugar — Which Is Healthier? 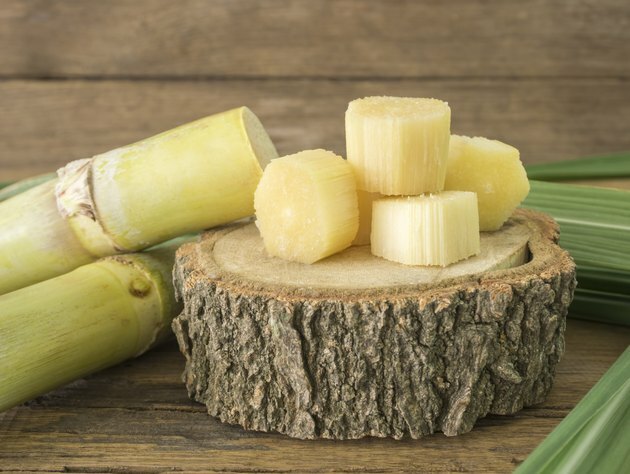 How Does Palm Sugar Affect Blood Glucose?